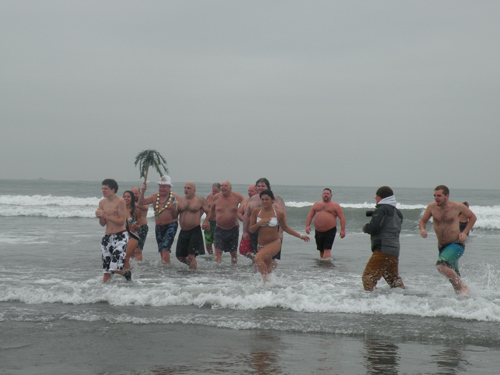 New Year's Day Polar Bear Plunge features some brave souls taking a dip in the frigid Atlantic Ocean at Newport's Easton's Beach. This event, which has been taking place since 1969, is a great time and benefits A Wish Come True, a group that grants wishes for sick children. Having some special guest swimmers (see photos below), doesn't hurt the turnout either! Palm trees and bikinis....Not a bad way to ring in the New Year! 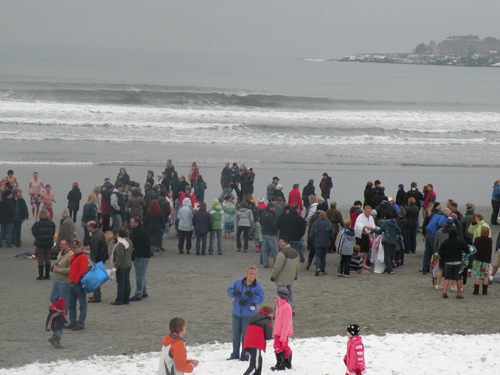 Bundled up spectators on Easton's Beach, with the Newport Cliff Walk in the background. 2010 was the first time I've attended this event. I was surprised at how many people actually went in the water. I was also impressed with the fact that the girls stuck around posing for pictures in their bikinis for awhile. If I ever mustered up the courage to do this, I'm sure I'd be in and out and wearing a heated robe the second I got out of the water! 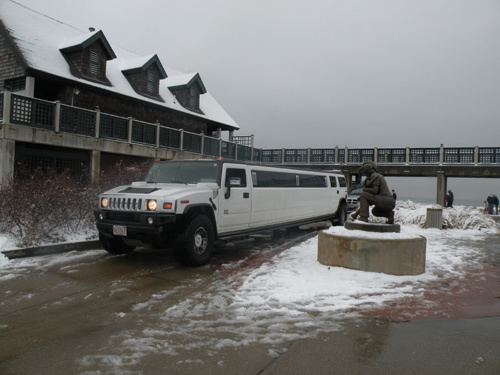 It's worth braving the cold for a photo op like this! This event is held every New Year's Day around 11 am. If you didn't make it this year, be sure and check it out next year. There's also an after party next door at the Atlantic Beach Club that is always a great time. Or if you just want to warm up after being out in the cold for an hour, you can get some coffee or hot chocolate at Dunkin Donuts right up the street!